Dear Japan, Today marks 66 years since your city, Hiroshima, faced the world’s first ever nuclear attack, and I thought I would write to apologise……..
at approximately 8.15am on 6 August, 1945, the United States dropped a gun-type atomic bomb called Little Boy on Hiroshima. 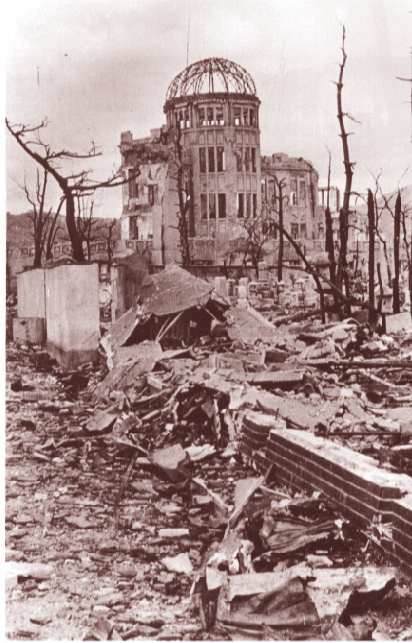 Between 70,000-80,000 people, or approximately 30 per cent of Hiroshima’s population, were killed instantly by what the subsequent US Bombing Survey termed “inefficient” nuclear fission, which nevertheless cleared 12 square kilometers of the city and 69 per cent of its buildings. I am sorry that Little Boy was not even less efficient; in fact I wish it had failed altogether. Another 70,000 of your people were injured, with 90 per cent of doctors and 93 per cent of nurses among the casualties, significantly disabling treatment for the injured and substantially raising the final death toll. Three days later, at 11:01am on August 9, while your government officials were still scrambling to ascertain the extent of damage done and the nature of this new threat, the US dropped a second, implosion-type atomic bomb called Fat Man on the city of Nagasaki. An estimated 40,000 people died in the initial blast, with 60,000 more injured. By January 1946, approximate acute deaths range from 90,000 to 166,000 for Hiroshima, and from 60,000 to 80,000 for Nagasaki, whose inhabitants were somewhat protected from the blast by an undulating geography…..
the atomic bombings were done for me, for my alleged freedom, so I apologise sincerely for constituting part of the rationale against you. While I had nothing to do with US president Truman’s initial public statements about seeking to avoid civilian casualties, I do apologise for my country’s lack of widespread outrage when so many scientific and political leaders’ statements were revealed to be untrue over the ensuing decades. Truman statements are particularly galling, mind you, given that all potential targets were selected for their strategic significance and urban civilian density, as well as to maximise blast potential and incendiary damage. By ruling out the other 66 cities that had already been significantly firebombed, by considering the surrounding geography – particularly of mountains to focus the blast – and by having both bombs explode in mid-air, the Targeting Committee could achieve what they called “the greatest psychological effect against Japan”, and generate an event “sufficiently spectacular” for the global community……. I’m sorry that two days before Little Boy was dropped on Hiroshima, Truman learned that the Twentieth Air Force had mined all your major harbours, thus finalising a comprehensive blockade that would literally as well as figuratively starve you, with or without a mainland offensive. Truman himself advised one of his senators two days before Nagasaki’s bombing, that the Japanese would “very shortly fold up” with the Russians entering the war. It is apparent from Allied leadership correspondence that your defeat had been a question of details for most of 1945, and there is a good case to be made for the late Soviet entry into the war as the decisive factor in you accepting unconditional surrender at last. So I guess I’m sorry that most Australians believe that the atomic bombings of Hiroshima and Nagasaki succeeded in ending the war and forestalling a grueling home invasion of your lands, when the case against this rationale is so easily available from decades of declassified US state sources.– …. Finally, perhaps you wonder why I am apologising. After all, I didn’t have anything to do with the design of the bomb, or with the decision or strategy to attack you with it.. I didn’t vote for Truman, Churchill, or even Chifley. And anyway, you did keep my grandfather imprisoned at various POW camps, including the infamous Changi Prison in Singapore. If you didn’t ruin his life exactly, you certainly transformed it. Who knows if that’s why he drank so much, and who knows how that affected my mum and how she raised me. On my own drunken walk home through the streets of Tokyo’s western suburbs, my friend Mitsu and I realised both our grandfathers fought each other; not directly (my grandfather was a medic, for starters) but against each other nonetheless. And they were, in a very real way, fighting for Mitsu and I, who would not be born for decades. We inherit from the past our own conditions of living. We inherit the burdens, responsibilities and sacrifices, as well as the opportunities. Whether I like it or not, I am part of the rationale against you, that led to the US atomic bombings of Hiroshima and Nagasaki. All this I owe to you, Japan, when I apologise. ….